Viewing time: 5 mins. 24 secs. 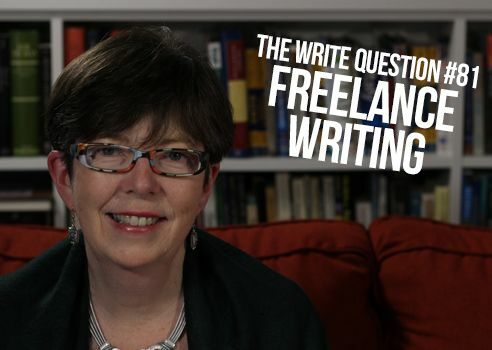 The Write Question is a weekly video podcast all about writing. Today’s question is about becoming a freelance writer. If you have a question you’d like me to answer you can email me at daphne@publicationcoach.com, tweet me @pubcoach, or leave a message for me at the Skype account, The Write Question. Welcome to The Write Question, I’m Daphne Gray-Grant and my topic today is about becoming a freelance writer. I have a question from Yassmin Manauchehri a translator based in San Pietro, California. Here’s what’s she’s asked. Thanks for your question, Yassmin. I have some good news and some bad news. The good? There have never been more opportunities for freelance writing than there are today. The explosion of the Internet has created many more platforms — including blogs and online newspapers and magazines — for aspiring writers. And the bad news? It’s harder to make money than ever before. Many of the outlets don’t pay or don’t pay terribly well. And the growth of the Internet has caused a corresponding decrease in print publications, many of which used to pay very well. Identify and develop your own particular subject area. If you try to be an expert on “everything” you’re essentially an expert on nothing. More important, if you have one relatively narrow area in which you develop some expertise, you’ll reduce the amount of research work you need to do. You’ll also increase your own visibility to editors. So, for example, don’t be an expert on ‘Sports.’ Become an expert on women’s soccer. Or lacrosse. Or non-pro tennis. You’ll quickly discover that you have a LOT to learn and as you learn this information your own confidence will also increase. Develop a thick skin. Understand that for every ‘yes,’ you’re likely going to need to hear a dozen ‘no’s. Do not take this personally. It’s a numbers game. You will succeed only a certain percent of the time and if you make more pitches or more asks, your absolute numbers will increase. Try to get more than one pitch out of every idea. For example, if you’re researching a story on a soccer player for a particular team, see if you can develop another way to spin the story. One publication might be interested in the athlete’s training program, while another might be interested in her personal life. One interview; two stories. Always work to get more than one story out of each idea. Never pitch ideas that a particular publication has already done. This mistake will reveal to the editor that you haven’t read their publication adequately, which is going to make them think you don’t have good research skills. Be sure to review at least two year’s worth of editions and make it four to six year’s worth for any publication that’s particularly important to you. Bottom line? Don’t suggest ideas that have already been done! Make sure you understand the style of the particular publication you have in your sights. Some pubs are deeply serious and require rigorous research. Others, have a lighter touch and might even be looking for a bit of humour. And all will have specific features — perhaps profiles, or “best of” lists or maybe specific ways of responding to news events. If you can match your pitch to their style, you’re much more likely to succeed. Be sure to follow the writer’s guidelines. All publications will have writer’s guidelines, which you can usually find on their website. These guidelines will cover spelling, subject areas they’re interested in and the specifics of how to pitch. Many will prefer email but some of them might want the pitch in the body of the email while others will want it as an attachment. Do whatever they ask for. Otherwise, I can guarantee you’ll never get an assignment from the pitch you make. Be persistent. Succeeding at being a freelance writer requires a great deal of persistence. I’ve addressed this issue in a previous video and I include a link, below. I think the best news for you, Yassmin, is that you’re not counting on getting 100% of your income from freelancing. This means it can become a pastime that will be rewarding in terms of the writing work itself and also in terms of the modest additional cash flow it might generate for you. Thanks for the question, Yassmin! Dipping your toes into a new career can be fun and exciting, if you have the right attitude. Try to view it as a game rather than a comment on your own worth as a writer or a human being.